Coming to a closure, also known as making decisions is always one of the most difficult challenges a group faces. This is not just about wasting time. This runs deeper. Leaders calling meetings seek buy-in and therefore ask for input on decisions they want to make. But more often than none leaders fail to listen to and communicate clearly with the people they’ve asked to join. Participants often don’t realise if or how the leader makes a decision. Thus meetings get a toxic character. This negatively affect morale, follow-up meetings start running overtime, conspiracy stories start buzzing around, etcetera. what decision rule should we apply? how do we deal with (the lack of) support? When it comes to decision rules there is a clear divide between authoritative and democratic decision-making. A leader with the authority to make a decision can do either so without discussion or after consultation. In any case the leader should make clear that he or she is taking the final decision and also when s/he is doing so. This clarity is often lacking. In his Modern Meeting Standard Al Pittampalli propagates a clear authoritative decision rule. The leader (not necessarily the highest in the hierarchy) is being granted powers to act and therefore makes decisions based on consultations with the others. In democratic decision-making the range is roughly between the majority vote and unanimous agreement. With the latter everyone is involved up till the last end when a decision can be made that suits everyone. In a majority vote the minority opinion can be disregarded. Now, how to deal with the issue of support (or buy-in)? Support usually comes in the form of a yes or no. 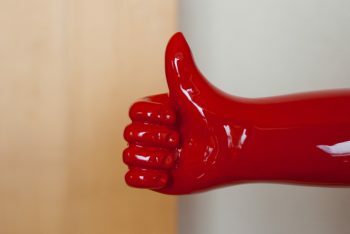 However having a yes does not necessarily mean people will follow through on the decision. Their yes might be half-hearted. Especially since saying no to a proposal many already (seem to) support is no easy thing. 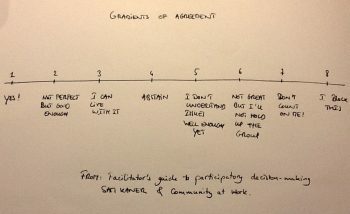 In the Facilitator’s Guide to Participatory Decision-Making, Sam Kaner tackles this issue with the Gradients of Agreement Scale. Participants give their support for a certain decision on a continuum going from yes to no. Thus becomes clear where participants stand and whether their support is enough to push the decision through.